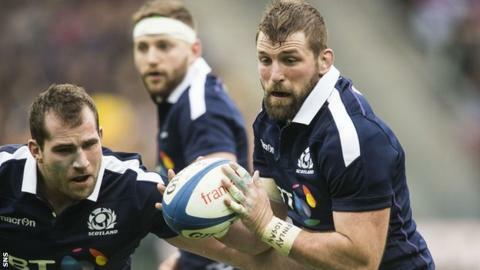 Two former Scotland captains have backed Vern Cotter's decision to award John Barclay the captaincy for the Six Nations game against Wales on Saturday. Speaking to the BBC, Andy Irvine described the 30-year-old back-rower as "a born leader", while Andy Nicol said he always knew Barclay would lead the national team at some stage. Barclay was given the nod on Thursday with Greig Laidlaw sidelined by injury. "He's been a great soldier and he's a very good leader," said Irvine. "A lot of people tipped young Jonny Gray. Jonny is a fantastic player but I think he is more comfortable playing his own game whereas John Barclay is more a born leader," Irvine added. "He'll talk more, he's a bit more experienced, he's older, he's wiser. I think it's a good call. "It won't be a surprise to the rest of the players - he's highly respected and he's in great form just now. He deserves it." Former scrum-half Nicol, who won 23 caps, told BBC Radio Scotland that his own position on the field was such that he could influence tactics by his actions rather than just his words, and that Barclay's placing in the pack would allow him to do likewise. "John's in the back row so he's very close to the decision makers like Ali Price and Finn Russell," he said. "John is very experienced so I think it's the right call. I'm delighted for John Barclay. He's had a remarkable renaissance in the Scotland jersey. He's one of the good guys. "When Matt Williams brought him out of school pretty much into the national squad, I met him early on and I was so impressed. "I thought then he was a future Scotland captain. It's taken a while but he has got there in the end."